The Governor-General, Lord Jellicoe, and Lady Jellicoe, accompanied by Mr W H Field, M. P., and Mrs Field, arrived in Otaki shortly after noon yesterday and were received by Mr and Mrs Brandon, Mayor and Mayoress, and Councillors, and Mr and Mrs. Wills at the Native Hostel…. A visit was afterwards paid to the native Church … An adjournment was then made to the kiosk where Mr C E Cotterell provided an appetising spread for some seventy guests…. 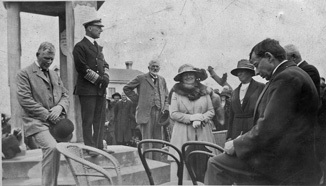 The Governor and Lady Jellicoe were then motored to the Otaki State School, where the children were lined up in readiness to receive them. From the gateway to the bubble fountain some 500 children, including children from other schools, assembled, and their Excellencies walked between the lines to the fountain….. Mr W B Smith, for many years headmaster of the school, and who was instrumental with Mrs. Smith in the erection of the fountain, gave an address …. Lord Jellicoe then unveiled the bubble fountain …. The Governor then asked that the children be given a holiday on the first fine day. The opening of the Bubble Fountain (Otaki’s second war memorial) at Otaki School on 30 October 1924. L to R: W H Field, Lord Jellicoe, William Burns Smith, Lady Jellicoe, Mrs Brandon, Hector Nicolson of the Otaki Mail. The current exhibition is “Otaki Remembers World War I”. Elements of this – particularly the Roll of Honour and the very popular horse – will remain in place until the end of May 2015. There will be some changes, however and from 4 December there will be new things to see. This will focus on some individual Otaki soldiers and also a display on the ship Otaki (named after our river) which was sunk by a German raider in 1917. The captain went down with his ship and was awarded a posthumous Victoria Cross. The Otaki Museum is at 49 Main Street and is open Thursdays, Fridays and Saturdays 10 am – 2 pm. On 7 October members enjoyed a fascinating talk by Catherine Knight, talking about her new book, Ravaged Beauty: An Environmental History of the Manawatu. The Manawatu River defines the region. Rangitane used the river; there were pa sites and as inland Manawatu was densely forested the river was an important means of travel. There were lagoons and swamps and the river was full of eels. Early settlers cleared and burnt the forest; since then wetlands important to its ecology have been destroyed by drainage and former swamps have become dairy land. Palmerston North’s first sewage scheme discharged direct into the river from the 1880s but a bubonic plague scare in 1900 forced rudimentary treatment. However industries like meat works and wool scouring still sent waste straight into the river and by the late 1970s it was highly polluted. Today the river is being revitalized and there are over 100 species of birds. However because pollution began in the 1870s it will take a long time to remedy the damage.